Grand Central, as part of their drive to take railway safety culture to the local communities,. have been working with children’s book author Chris Madeley on a follow up to her hugely successful Cones series. The Cones have now taken to the rails in Book 3 – Cones on Rails. All is not fun and games as the Cones learn to respect platforms, learn on-board and on-track safety, to say nothing of what happens at an unmanned level crossing! They learn new words and meet new friends as they have an incredible adventure which helps them to be much wiser Cones. 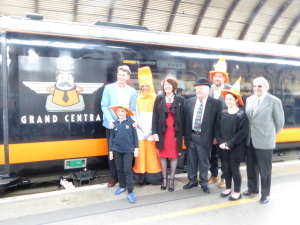 As part of the promotion GC on 15th May unveiled a Cones version of the Grand Central logo on one of their 180s. It will only be there for a month, so watch out for it!